CALBAYOG CITY – Samar Governor Sharee Ann Tan bluntly expressed her disappointment and disgust on the acts of the 7 board members in not taking steps for the immediate approval of the 2010 annual budget. Through a dialogue with the employees of Calbayog District Hospital last Sunday, she openly underscored the five and two board members from the first and second district, respectively, who allegedly dominating the legislative and blocking the approval of the P1.18 Billion annual budget which could be used for some development programs and projects of the province. With the constant resistance of the majority, she blamed the majority for making the provincial government merely an employment agency. Tan was referring to the changes that she wanted to implement not only at Calbayog District Hospital but also with other hospitals within her jurisdiction such as renovations, upgrading or providing facilities and equipment. While the budget is subject for the SP control, she said that a P3 Million Phil Health savings would be used for the essential needs of said hospital. She clarified that the budget also contains the P20,000 cost sharing/counterpart financial assistance for barangays to facilitate the implementation of their projects; the 25% per month increase for all provincial employees; and the P12,000 productivity long approved by the former governor. While Tan was explicitly declaring her displeasure on how the opposition allegedly doubt her credibility, she never failed to mention her mother, the former governor, and been very grateful for the trust she and her family obtained by winning last elections. At this point, the younger Tan admitted that there were lapses during her mom’s administration which she attributed to excessive politicking. Tan also mentioned the P17 Million DOH Fund which has been a subject of SP approval. Said assistance she said would be used for the purchase of hospital equipment as well as its repair and rehabilitation. “Maupay kunta kun mahiabot iton ha aton. But three sessions na yana, three Thursdays ko na ginhihinatag ha ira para ko na mapirmahan, pero an natatabo, allergic an 5 nga board members pag nabati na hira, kon may figures ug may kuwarta na nga involve. Nahahadluk hira nga makakarawat kita hito nga pundo. Kay ano man nga mahahadluk hira nga para man iton han probinsya? Aside from implicating the 5 BM in the “non-approval” of the budget, the governor also revealed that Mayor Reynaldo Uy and Cong. Mel Sarmiento went to the DBM allegedly requesting Sec. Abad to just approve and allow the release of selected items in the annual budget such as the salary increase of the government employees as well as the approval of the supplemental budget disregarding the annual budget. Since it was the first time that she took a visit and met CDH employees, she demanded loyalty, efficacy and a harmonious working area from among her personnel. Lastly, she announced that CDH have already 7 doctors, and hiring medical technologist, pharmacist and other office personnel. Rotary Club Tacloban would be donating 4-tonner supply/medical equipment for the hospital. “Let’s make love not war and I am expecting a full support from everyone”, she concluded. BORONGAN CITY – With the current record of about 600 dengue cases, Eastern Samar Governor Conrado B. Nicart, Jr. ordered the most urgent action to combat the disease. The order which was spelled out in a letter sent to the city and municipal mayors, and chiefs of hospitals, instructed among others the health personnel, led by Provincial Health Officer, Dr. Marian Isiderio to organize three Outbreak Response Teams, which would coordinate with the mayors down to the barangay chairmen. In an interview, Dr. Isiderio mentioned that Gov. Nicart first instructed them, to strengthen the information campaign and advocacy, and second, check the hospital conditions in the entire province, vis-à-vis supplies and other needs. Immediately, Dr. Isiderio said that the three teams are arranged as follows: Team A, covers the municipalities of San Julian up to Arteche; Team B, for Maydolong to Guiuan and Team C would concentrate in schools and in Borongan where most of the patients come from. The Lady Health Officer mentioned that indeed, the teams’ main objective would be to increase the people’s level of understanding and ultimately convince them to act on the 4S: 1-Search and Destroy; 2-Seek and Control; 3-Self-Protection by using mosquito nets and repellants; and 4-Say no to indiscriminate fogging. She warned that fogging cannot just be done because there are some criteria which are being followed before any fogging thing is done. Asked why dengue in the province has blown to this level and magnitude, the information-generous doctor replied. “The rainy season has set in and these deadly mosquitoes thrive in clean, stagnant waters, i.e. flower vases, uncovered water deposits, bottles, used car tires, etc. Last year we had some 450 dengue cases for the whole year, whereas from January to July 14 this year about 620 had already been reported”, Dr. Isiderio reported. “We are very happy, some personnel from DOH Surveillance Team are set to come and check our situation and help us through, but it would still be best for every household to assume the responsibility of cleaning their houses and surroundings”, Dr. Isiderio suggested. CALBAYOG CITY, Samar – The P25,000 Productivity Enhancement Incentive of Samar provincial employees has yet to be realized while the 2010 annual budget is undergoing a thorough scrutiny from the 7 members of the Sangguniang Panlalawigan. 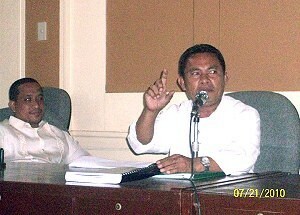 BM Jasper Sumagang, the proponent of an ordinance granting the employees' PEI lobbied for its inclusion during the session. The firm disposition of the majority motivated BM Jasper Sumagang to propose an ordinance reverting the amount of P50 million to be taken from the unexpended balance of the re-enacted budget for CY 2009 and reappropriating the same for the implementation of the first tranche monthly salary schedule of local government personnel in pursuance to local budget circular no. 2009-92 dated September 2, 2009 of the DBM. But the move for inclusion of said proposal became a ground for objection of ABC President Joseph Escober questioning the legality of said proposed ordinance. He, as a member of the minority had been the subject of criticism as he was somewhat circumventing the proper legislative procedure. The majority which is composed of Coñejos, Sumagang, Atty. Eunice Babalcon, Atty. Noel Sermense, Jimmy Dy, Prudencio Dy and Renato Uy were almost infuriated by the behavior of Escober as the latter’s basis for objection was improper. The legislative body was not the right venue to declare the legality or validity of an ordinance. Only the judiciary can do that said Babalcon. The majority presumed that it was Escober’s excuse to elude the possible division of the body which would end up probable inclusion of Sumagang’s sponsored ordinance while the session was tackling on the other matters. In turn, BM Sumagang decided to withdraw his motion for inclusion and the said ordinance would be subject for this week’s regular session. CAMP LUKBAN, Catbalogan City, Samar – A single tip from a civilian conversant to the terrorist New People’s Army (NPA) activities brought out to the recovery of a high powered firearm in Brgy. Anagasi, Paranas, Samar, July 25. Report reaching to this headquarters from the Army’s 34th Infantry Battalion disclosed that 1Lt. Jewelry Servinas received a report that some armed men were frequently seen loitering in the outskirts of said barangay that causes fear and uneasiness to the localities. Around 9 o’clock in the morning when troops under 1Lt. Servinas searched the area directly pointed out and identified by the tipster who happened to be t he same person who saw the armed men actually. The tipster led Servinas’ troops to a farm hut where they recovered an M16 rifle with magazines loaded with 19 live munitions. Also seen in the area are two (2) back packs containing civilian clothes and two (2) poncho or military rain coats. Moreover, same tipster led the troops to a place about one (1) kilometer away from the place where they discovered an m16 rifle. It was almost 2:30 in the afternoon of their continuous search when one (1) upper receiver part of an M16 and two (2) empty magazines for M14 came into open. Accordingly, the enemy might dismantle their rifles in order to avoid the complete recovery of the government forces. With these results, Major General Arthur I. Tabaquero, commander of 8th Infantry Division ordered all his unit commanders to intensify the security operations in order to neutralize the remnants of the bandits operating in the area in expense of the innocent people. He further conveyed his heartfelt regards for the continuous support extended by the civilians who shows concerns for the lasting peace and development of the region. “The success of this operation is attributed to our people whom we are mandated to serve. This is a unified accomplishment of both Army and civilian who both desire to attain peace and subsequently development in this part of the land. Our people deserve to be congratulated for a job very well done,” he uttered. “The recovered firearm means a lot to our aspirations to indulge peace for we’ve already avoided the supposed lives that could be taken using such fire arms. In the part of the Army, that is a win-win result. Win in the part of the Army, win in the part of our people”, the good general added. CALBAYOG CITY – Samar’s majority SP members blew up defending themselves from the opposition’s accusations on the alleged boycott as an affirmation of their persistent disapproval of the 2010 annual budget. SP members Jimmy Dy and Atty. Eunice Babalcon refuted the boycott issue. They clarified that the absence of the majority during the previous sessions should not be used as a pattern and basis of their conclusion. Accordingly, the 2010 budget would be the source of the “25 thousand productivity enhancement incentive” of the province’s more or less 1 thousand employees which took effect on January 1 this year. “Pamati ko han pag-apura, pwede pa magsakripisyo ha kadali. Pero inagi na an 9 katuig, nakaghulat man hira! Ano man an nahimo han 9 katuig? Paraffle? An 9 katuig, an tig 2 ngadto 5 ka kilo nga bugas? An pagpapirma blangko nga papel han mga barangay kapitan? Siguro mailob niyo ngada han pag-aprub han budget. Siguro ginsaaran kamo tigpira kasako nga semento… 50-100. Iton ba sigurado nga mahingangadto han mga taga barangay? Pakiana, kadamo san mga taga barangay nga hasta yana may mga semento pa, mga semento nga nagbagtik. Now, ungay kita han pag-aprubar komo magbaralaud. Natugot ka nga mahingangadto an sugad hini nga pundo? Tikang iton diin nga pundo? Di ba tikang ha gobyerno? So kinahanglan aton himay-himayon. Waray ako magngaran kon hino an naghatag san semento. Waray ako magngaran kon hino an kumarawat han semento. An aton la, mahingangadto ba han tama an buwis nga ginbabayad ni Juan dela Cruz ngadto han gugti nga mga tawo dida han mga kaburubarangayan”, board member Coñejos likewise explained. 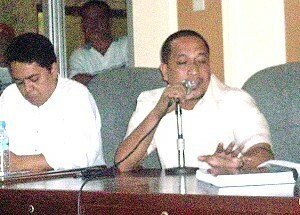 Majority Floor Leader Charlie Coñejos (1st district) during the SP presscon as he conveyed their justifications in scrutinizing the 2010 budget. Through a press conference last Thursday at the session hall of Samar Capitol, Majority Floor Leader Charlie Coñejos finally broke his silence together with other board members and answered all the allegations imputed against them by other media group in Catbalogan City. Babalcon, the only lady member of the legislative body clarified that the approval of the budget without a thorough scrutiny would not in any way be helping the province. Just like in the previous administration where the budget did not undergo an in-depth legislative procedure, there were doubtful appropriations in every department which affected the implementation of the programs and projects of the province. “Why would we take part on a budget which we believed has never served our people in Samar? Why would we take part when there are so many questionable items that we want to raise? The budget presented before this body was the same budget prepared by the former governor. It’s the same old system, same items in the budget that they want us to approve. They’re bringing out the issue that why are we prolonging the agony of the employees? My question is, why are they using the employees just so they can make it leverage for us to approve the budget? From past experience, the budget has not helped the poor Samarenos. It never happened,” bared Babalcon. 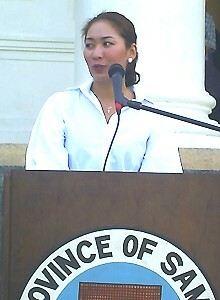 Babalcon challenged the new governor, Sharee Ann Tan to present a new budget. She might end up reconsidering it should there be changes and clarifications on some items listed in the 2010 annual budget. As part of a legislative procedure, one of the best solutions in order to resolve the issue (i.e. double funding) is to call the attention of every department and verify from them what they would want to consider for funding. As the body is advocating for transparency, everyone is encouraged to attend, to participate and be held accountable. That in a way would forestall the idea of constantly blaming the board members when it comes to ineffective implementation. Once there is already a legislative authority granted to the local chief executive, everything that is there in the budget is within her disposal for implementation. That is precisely the reason why we are scrutinizing it. The Commission on Audit has failed for the past 9 years to do their job, Babalcon disclosed. Atty. Jasper Sumagang seconded and agreed to the idea that the budget should undergo a regular legislative process by referring it through a committee hearing. He said that the approval of the budget would not solve the problem of Samar. By scrutinizing it and ensuring that the people would benefit up to the last centavo. Budget and Appropriations Chair Noel Sermense opined that the budget should have been referred to Committees on Budget Review and Laws. Under the law, it should be submitted on October 16 of the fiscal year, but it was only on February 25, 2010 that said budget was submitted to the August body. The failure of the SP to enact the budget within 90 days has led to utilize the reenacted budget of 2008. The 2009 unapproved budget should be refiled this year; but with the new administration, a revised budget should be submitted. Sermense also said that the Annual Investment Plan (AIP) should be passed ahead of the budget after a consensus with the stakeholders. The 2010 annual budget of Samar is 1.18 billion pesos. Indeed, SP members admitted that the copy of the budget has been distributed only on the day of the session; and they observed that the signatory was still the former governor, Milagrosa Tan. TACLOBAN CITY – Several Filipino children aged 9 to 15 from various marginalized communities which are being served by Plan International, will showcase their video and photographic productions Monday night at the Liloan Gym in Southern Leyte. Mr. Totch dela Cruz of Plan International said that the media event is meant not only to showcase the kids' skills but also to show their respective communities that children can be harnessed in development efforts. The kids who come from Camotes Island in Cebu, Samar, Northern Samar and Southern Leyte, were trained by Anak TV, a Plan International partner, in aspects related to media literacy and production such as digital photography, camera work, video production, scoring and basic editing. An exhibit will be mounted to feature the best photographs that evoke children's views about the world around them. MTVs will be played to express children's insights about being kids. Thirty minute video public service announcements (PSAs) will cap the presentation. The brief public service announcements cover a wide range of topics, mostly social. Among them are child abuse, child labor, poverty, garbage, environmental degradation, gambling, the need to conserve coastal resources and many others. The works of the kids were previewed recently by executives from ABS-CBN, RPN, IBC, UNTV and GMA, all of who expressed interest in them and suggested that the best ones be broadcast nationally. BARANGAY DONGON, Maasin City – It’s Mayor Roberto Loquinte of Anahawan town. The Southern Leyte Chapter of the League of Municipalities of the Philippines (LMP), in a gathering of sixteen out of the eighteen municipal Mayors in Governor Damian Mercado’s Farm Resort here, voted literally in unison the second-termer chief executive of Anahawan, one of six towns situated in the pacific area of the province. This was learned from former Tanauan Mayor and now Leyte Provincial Board Member Roque Tiu, who emerged from a closed door meeting a few minutes before noon on Saturday. Board Member Tiu told PIA his presence in the election was more on supervision by virtue of his being an Executive Board Member of the national LMP. As gleaned from a copy of Tiu’s staff, here is the complete list of the LMP Officers in Southern Leyte: President, Mayor Roberto Loquinte (Anahawan); Vice-President, Ricardo Borces (Padre Burgos); Secretary, Oliver Ranque (Libagon); Treasurer, Fe Edillo (Macrohon); Auditor, Evelyn Lee (Hinundayan); PRO, Melchor Petracorta (Limasawa). Directors: Romeo Gomez (Hinunangan), Samson Gamutan (San Francisco), Celsa Estrella (Pintuyan), Matias Ruales (Bontoc), Manuel Labrador (Silago), Federico Flores (San Juan), Rico Rentuza (Saint Bernard), William Yu (San Ricardo). Members: Agustin Escano (Tomas Oppus), Sherlita Chong (Liloan), Allan Go (Malitbog), Sheffered Tan (Sogod). Only Mayor Rentuza of Saint Bernard, who was reportedly out of the country and Sogod Mayor Tan were unable to attend. There was no word on why Tan was not around. Gov. Mercado was also not around when the election was in progress, but he arrived a few minutes before twelve noon and conferred closed doors with the Mayors for more than twenty minutes. Mayor Loquinte took over the position held by former Bontoc Mayor, now Vice-Mayor, Pete Fustanes.